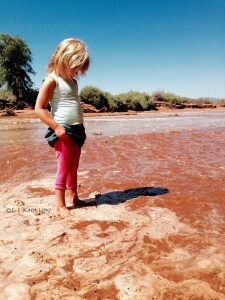 We shuffled down the sandy banks to the riverbed and watched as the unstoppable water crept down the river. Our sandy playground was submerged. Our doors for the river-fairies, made from sticks and plants with vast amounts of love and detail, were covered in a flash by the long-awaited water and bubbles of froth. 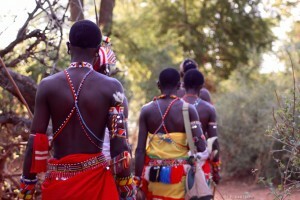 Warriors and camp staff joined us and we all stood elated, as the dry river was revived, revitalised and renewed. There was an air of celebration; the symbol, and cause, of a new cycle of life was here. I stood silently, watching the river fill as it trickled round our feet, until the thought we were standing on dry sand just minutes ago, seemed quite absurd. The holes dug by animals desperately seeking water were flooded as water splashed over the edges like waterfalls, until they were removed from sight completely. The river speed increased and we retracted to the banks to watch for a few moments more. Tonight, in true Samburu style, we will revel in the delight of the Ewaso Nyiro’s rushing return, on top of the sundowner hill. Susan, kuja. Every muscle in my body froze as I recognised the Swahili being directed at me from the centre of the jumping, chanting crowd of Samburu warriors. Susan, come. I was surprised that I could identify, amongst a chorus of up to 20 warriors creating a serious noise, exactly who was inviting me to join. 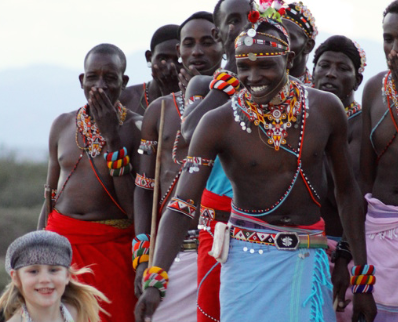 I don’t dance – at least not confidently enough to waltz into a Samburu dance of numerous warriors with guests watching nearby. But when the dance floor is a mountain top, illuminated by the backdrop of a setting African sun, and a Samburu warrior has shouted your name to tell you to get off your chair and line up with those who are jumping incredible heights into the air, chanting deeply and moving with total grace, you do as you are told. You get up and join the silhouettes whose movements enchant what’s left of the evening light. I simply cannot adequately explain experiencing the depth of the hums, the rhythmic pulse of upper bodies, the exceptional height in the leaps skyward as you find yourself totally surrounded by dancing warriors – to the point you really cannot see anything else bar the darkening sky above. Warriors I now know by name. Warriors who flew into the air either side of me, and ladies who encouraged and led the way. Attempting to draw back from the group only spurred them to take me into the crowd further. Ochre hair was flicked into my face; the little Samburu they’ve taught me was spoken mid jump; a head dress of feathers was enthusiastically brushed across my forehead (apparently a translated version of ‘cheers’). The bright smiles and body language between them was electric. This was, after all, a party – and anything but a ‘show’. The singing and dancing continued well past sunset. The three girls, locked in a circle of warriors, joined in so naturally. 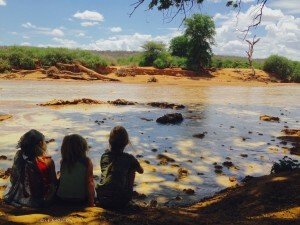 They are Kenyan children, yes, but their hearts are absolutely filled with Samburu magic. The relationship between each of them individually and their separate ‘favourite’ warrior is charming to watch and I know that the little I feel from my time here is, in comparison, only a scratch on what these girls and their mother have built up over time with these incredible people There is real magic here and yesterday, thanks to water and warriors, it was one where I fell asleep grateful for having spent my hours of this day here.